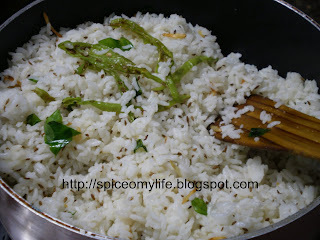 Jeera Rice is a very simple and easy dish. This is almost bland with a subtle flavor of Jeera or Cumin. One thing I want to clarify here is, there are many ways to make a dish. The method and ingredients may vary from region to region or household to household. Traditional methods are always preserved. So, as far as possible I will try to give the traditional method but also the variations. Apart from that, one should try out a dish and then experiment with it to suit their taste. Unless one experiments, how new dishes can be created? Clean the rice well, with water . Add water in 1:1 ratio by measure and cook in a cooker. Remove it from the cooker on cooling, spread it on a plate and keep aside. The grains should not be sticky. 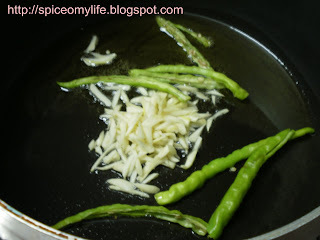 Now in a pan heat oil, add ginger garlic and fry for few minutes till they turn light brown. Then add the green chillies slit length wise into halves. Fry for two minutes. Add curry leaves and cumin seeds. fry for a minute. Cumin starts crackling. Now add cooked rice and mix . Add salt, pepper powder. Fry for few minutes. A dash of Garam Masala powder can also be added. Serve hot with any curries with gravy, and raitha (curd mixed with vegetables). 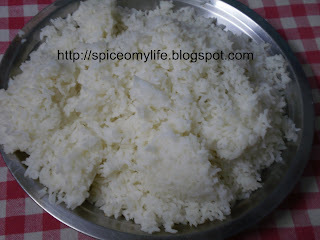 Rice should be long grained, preferably Basmathi Rice( a variety) which gives off a subtle fragrance. But I have used ordinary Rice which we eat daily. Its better to use Rice that is at least six months old. New ones have moisture content and become sticky. Clean the rice thoroughly with water before use. While cooking Rice, generally water in the ratio of 1: 1 is used. In some cases 1(rice);1 1/2(water) can also be used. Please check how the rice cooks. The grains should not stick to each other. The quantities of chillies, pepper, garlic can be varied according to taste. Ginger can also be added along with garlic. Refined oil is best but Ghee or clarified butter is traditionally used and gives a very good taste. This will serve two to three persons. Hello Sailaja,your recipe looks interesting,and I would like to try it,but since I'm from Serbia I cant find all the spices you use. 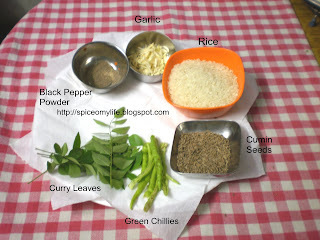 Is it possible to omit curry leaves and add curry powder instead?